Rising Voices » Could Social Media Unlock Disaster Relief? As access to mobile technology continues to advance around the world, with a humanitarian disaster comes instant images and updates across the internet. There are critical moments at which mass amounts of data appear on social media, posted moment by moment as the aftermaths unfold. This potentially means a wealth of information for humanitarian response… as long as the information can be understood by responders. Logging, identifying, and translating this type of data has been shown to be a effective but complicated and confusing tool. Processing of the information could happen with volunteers from around the world – useful, as long as it is well organized. MicroMappers is a newly released set of apps, a project to provide the public with an extremely simple way to access and process this information. Its goal is, through this data processing, to identify the areas most effected by crises, and to help quickly and effectively to humanitarian relief teams. The app is developed around microtasking, where the concept is to break a large and complex task down into a seires of much smaller and easier tasks. 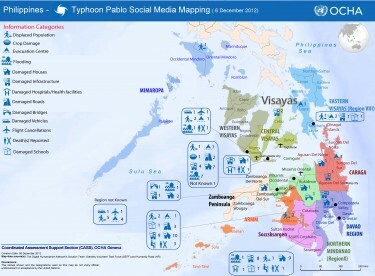 The United Nations recently asked digital humanitarian volunteers to carry out a Twitter-based rapid damage assessment following the devastating typhoon that hit the Philippines. 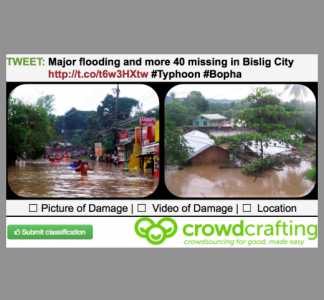 So volunteers used a Microtasking App to tag individual tweets if said tweets had a link that pointed to an image or video documenting typhoon damage. This project, “to filter, classify, and geo-reference thousands of tweets” was created along with CrowdCrafting, and some of this information was also used on Google's Crisis Map of the event. If there are enough geotagged pictures within well-defined affected ares, this has the potnetial to move into an app like Photosynth for rapid damage assessment. This techonlogy would stitch together user-generated image content to create three dimensional generated images. Once the website is fully up and running (launched the date of publication of this article – the 15 May 2013 in conjunction with Meier’s TedX Talk), volunteers will be able to sign up to be notified when a disaster is occurring that they can join in on. There will also be a set of training data to practice the technology, based around the Philippines typhoon diasater of this past year. 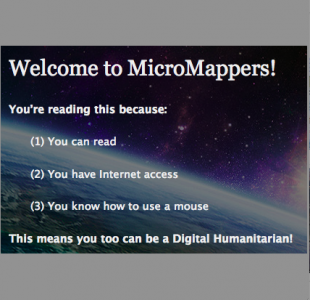 MicroMappers is a partnership between United Nations, QCRI, and CrowdCrafting. You can learn more about other efforts in digital humanitarian response at Meier's organization Crisis Mappers. Note: All images are reproduced with permission from MicroMappers and irevolution.net.